You Are Here: Home » Around the Web » Swoon Sunday: Toby Cooper from Winging It by Cate Cameron! Swoon Sunday: Toby Cooper from Winging It by Cate Cameron! Welcome to Swoon Sunday where you get to meet some of our swoon-worthy heroes. Today we have a visit from Toby Cooper from Winging It by Cate Cameron! Toby, what is your profession? I have a semi-profession, I guess. Semi-pro hockey—they pay us, but not all that much. Most of the guys on the team are still in high school, and the older guys either have part-time jobs or they go to college part-time or something. I’m graduating from high school this year, so if I don’t get drafted, or if I get drafted but not called up, I’ll probably try to take a couple classes. No idea what kind, though. Just something to keep my parents from thinking I’m being lazy, mostly. Corrigan Falls, Ontario. Smallest market in the OHL, but we punch above our weight, for sure. I’ve lived here all my life—I’m one of the few OHL players to get drafted by his home team. Most of the time I like that, because everyone’s familiar and my family’s still around and everything. Sometimes I wish I’d gotten the chance to start over somewhere new, like a lot of the guys did. When Dawn and I broke up? That would have been a lot easier to take if it hadn’t felt like half the town was on her side, half on mine. NHL. Easy. You want something more specific? Winning goal, overtime, Stanley Cup final game. Hell, let’s make it a home game, just to get the whole crowd experience. I’d like to push it even further and say it should be a home game in Toronto so all my friends and family would be close enough to drive down for it, but that would mean the Leafs winning the Cup sometime in the next twenty years or so, and that seems like we’re taking “dream” just a little too far. I’m a teenage boy. My ideal date would start and end in bed. Somewhere with a lot more privacy than my bedroom at home, for sure. Oh, and a huge shower. One of those ones with jets coming out of the sides and everything? Like a whole room, just dedicated to showering. Me and my date would hang out in there, and… then eat some pizza? I’m a pretty classy guy, huh? Hockey. Playing it. If I can’t play it, I want to watch it. If I can’t watch it, I want to talk about it, or read about it, or dream about it. Slapshot. Have you heard of it? No? Guess what it’s about… that’s right, hockey! There’s kind of a romance plot, and some stupid stuff about not fighting, but mostly—old school hockey, all these guys skating around without helmets or anything, beating the crap out of each other… it’s a classic, for sure. Boxer briefs. A comfortable compromise. Can’t tell you. It’s top secret. But, yes, I do have one. From a book. That’s all I can say, I’m afraid. “You’re sure about this?” I asked, still hoping she’d back down. She nodded, keeping her gaze on her boots. “There’s no one here to see!” she said, sounding young and kind of lost, and again I felt bad for half a second before remembering that this was all her idea and she was the one using me. I tried to pull my hand away, because, no, not like that. I wasn’t against the idea of kissing her. Not at all, I realized. But not like that. Of course, I’d forgotten who I was dealing with. Nat held on, gripping tight enough that I thought I might hurt her if I pulled away. And we sat frozen like that, staring at each other, both waiting for the other’s will to collapse. Nat couldn’t flirt. At least, I’d never seen her do it, and I wasn’t seeing her do it right then, either. She was just being honest. None of those other people were with me. She was. And when she squeezed my hand and leaned toward me, I leaned in, too. We met somewhere over the gearshift. It wasn’t a great kiss…we were both too tense, and the whole thing felt unnatural. Well, not exactly. In a way, it felt too natural, but that kind of freaked me out and made me self-conscious. After a few awkward seconds, I leaned away. But she didn’t let me go far. “We need to do better than that,” she whispered. I think it was the “we” that made me relax. Yeah, this was a weird situation, but it was still just me and Nat. The two of us had been a team for a long time and we still could be; we just needed to remember how. When Nat asks Toby to be her fake boyfriend, he can’t say no. Not when it means getting his best friend back. Natalie is all grown up now, and spending time with her—even when it’s just playing hockey together—stirs up a lot of feelings, old and new. Suddenly pretending to be interested in her isn’t hard at all…if only she wanted him and not enemy. Big News for True Born Means a Big Giveaway for You! 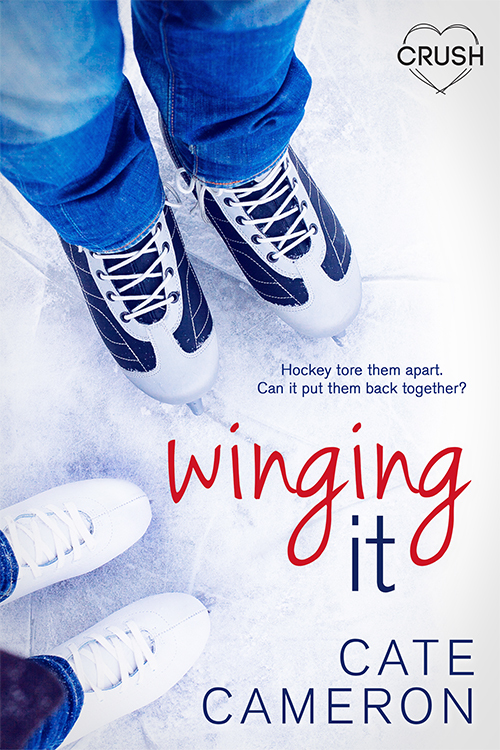 Happy Book Birthday to Winging It!